The name Gordon Setter was given to the breed due to its close links with the fourth Duke of Gordon and his ancestral home in Scotland at Gordon Castle. The Duke had a strong kennel of working dogs in the early 1800s and he was known to favour the beautifully marked Black and Tan Setters. Black and fallow dogs were mentioned in early writings from the 17th Century and although others were bred along different lines from the Duke of Gordon's dogs, the breed has been named in his honour as one of its main founders. These delightful dogs usually live to 12 years, but Gordon Setters can easily live up to 14 years of age given the right food and lots of care and attention. Males in top condition for this breed weigh about 32kg and stand 67cm tall while the females are 26kg and reach 62cm in height. The Gordon Setter has a character all of its own. It is quick and alert, but must be neither aggressive nor shy. This is not a dog that adapts well to life in a kennel, but one that needs and demands attention for its proper development. 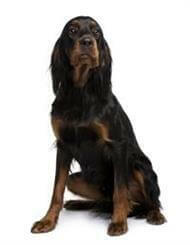 The Gordon Setter returns love and attention with unwavering loyalty. It has a strong protective sense towards members of its family and home, but usually will readily adapt its owner's attitude to strangers or visitors. This extreme loyalty and intelligence makes the Gordon Setter an excellent pet, as well as one which has a record of success in both obedience and field work. As the owner of a Gordon Setter you will need to ensure that your dog has proper housing, feeding, exercise and training. A safe, fenced yard and a bed in a draught-free area is a must. Above all else, a Gordon Setter needs lots of your time and company. Take your Gordon Setter out on a lead for regular walks. A dog that barks excessively is likely to be bored and needs more of your attention and a change of scenery. Heat stress can kill your dog - make sure it is not left in a car or trailer for even a few minutes. To cool your dog down, do not put wet towels on its back but rather, place it on a cool wet surface in a shady spot, using fans if necessary to increase air circulation. Anyone with the time and dedication required to groom and exercise an active animal.